Now that the warm weather is on its way, our succulents will be waking up from their sleepy winter and starting to grow. Spring is the start of their prime growing season (well, most species anyway) and is the perfect time to give some attention to those sad looking succulent pots. Now is the time to weed - Don't sigh, you know it's time... Pull out all those bubba weeds that have shot up. Do it now, before those pots become more weed than succulent. Your plants will thank you for it. Tidy up - Remove any dead or rotting leaves. This is especially true for your rosette types (sempervivums/echeverieas) that grow from the centre out and have old, rotting leaves on the outside and underneath the rosette. It's important to remove these to promote new growth and ensure the rot wont spread to the main plant. Re-pot if necessary - Spring is the perfect time to re-pot those succulents that have been sitting in the same potting mix for several years, or those who's potting mix has collapsed to well below the lip of the pot. Applying a fresh mix is a great way to give your plants a new lease at life, you will be providing them with an abundant source of nutrients, and it will also help with the drainage of your potted succulent, as that old mix has probably become a little water repellent over time. Now is the time to fertilise - Speaking of nutrients, now is the perfect time to re-apply that control release fertiliser. You can also apply a seaweed or blood and bone solution to give your plants a kick start to spring. Mulch - Mulch isn't just for the garden. Potted succulents will benefit just as much from a good layer of gravel. Not only does it make the plant 'pop' and look absolutely stunning, it also helps prevent water evaporation from the soil. It provides the roots insulation from the suns rays, which is vital in WA's intense summer heat. 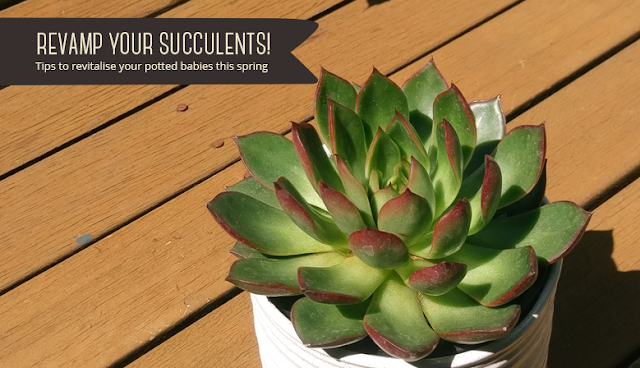 Sun - Spring is the main growing season for most succulents. So make the most of it! Make sure your potted plants are receiving a decent amount of sunshine. Place them in a well lit area and they will burst into life. We are very fortunate here in Perth to not experience frequent frosts during winter. But that doesn't mean they can't happen - This photo above was taken in July 2015 when the temperatures dipped to below freezing just after the sun rose. It was only for a very short period of time, and it only dipped a little below 0, but still, you can see the effect it had on my poor oregano plant! Very pretty, but also pretty devastating if you have succulents. Why is that? Succulents retain water in their foliage, which is what gives them their fleshy look. This is what freezes when the temperatures dip. Some succulents are more prone than others - The more 'fleshy' the foliage, the more susceptible they are. Species of Sempervivum, for example, have thinner, tougher leaves. They originate from Alpine regions and can tolerate frosts easier than say, species of Echeveria, with their juicy, plump foliage. 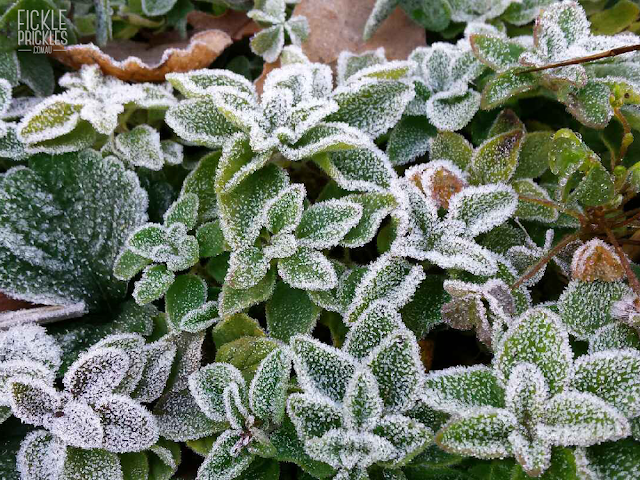 How can you protect your succulents from frost damage? It is relatively easy to protect your succulent babies from being damaged by frosts, all it takes is a little planning and forward thinking. Like I said, we are lucky to not have below freezing temperatures for very long, and at worse, we generally only see temperatures of -1 or -2, so little changes can make a big difference. Pick them up off the ground. Frosts tend to rise from the ground no more than say half a meter, so simply by placing your pots on a table or plant stand, you may have done enough to protect them already. Minimise their exposure. This can be done by placing them under a verandah or patio instead of outside in the elements. Placing your pots near the walls of your house is also great. Insulation. Mulch your pots with pebbles and/or gravel. Whilst it may seem like this will only protect the soil and roots of your succulent and not the foliage, stones will retain heat from the day longer than just bare soil. Having your foliage in close proximity to this 'insulation' will help prevent the immediate air around your pot plant from dipping that one degree below zero and generating icicles on your foliage. Gardens are a little trickier to protect, as you cant just 'relocate' them until the weather improves like you can with pots. However the same sort of principles do apply. Mulch your gardens. As mentioned above, mulching will help keep the immediate air around your plants that little bit warmer than just bare soil. Plant in mass. A singular plant on its own is exposed in all directions to the cold. Plant in mass and they will create a little eco-system of their own and help keep each other warm. Like you see the penguins do when a blizzard comes! Use masonry in your landscape design. Sculptures, statues and even large rocks are all perfect at absorbing the sun during the day and cooling down slowly at night. Plant your more susceptible species near these features and it will provide them with protection from the cold. I hope these tips help you protect your succulent collection from the frosts this winter and get them through to the warmer weather in spring. Little Aeonium - The perfect mini tree for a Fairy Garden! Makes a wonderful fairy garden mini tree. Such a gorgeous succuelnt this Aeonium lindleyi var. viscatum 'Irish Bouquet' . Winter is the peak growing season for Aeoniums, and what we love about this Aeonium is it's fleshy leaves that have an unusual waxy/rubbery texture. Can also be pruned to make a mini shrub for a fairy garden. Definitely one of our faves right now. 4 more DIY succulent valentine ideas! Skip the chocolates this year, and those expensive flower arrangements that only last a week - Give your Valentine a special gift that will last! We have found 4 really simple, yet incredibly adorable Valentine's gift tutorials that your special someone will love!
" 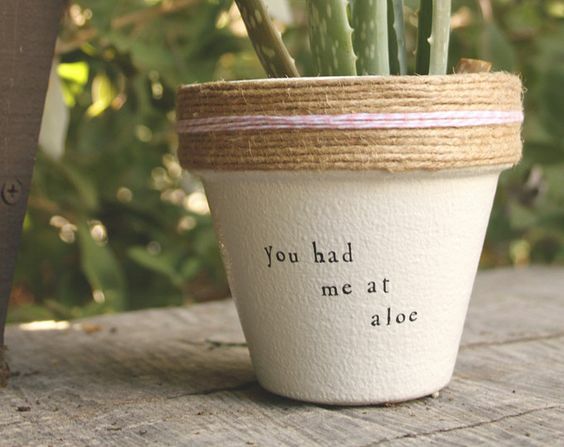 I ALOE you VERA much"
"My life would SUCC without you"
and "I'm so glad I pricked you"
Plant a succulent of your choosing and you have one punnerific valentine's gift. I love this idea - so simple, yet really dramatic. I think the hardest part would be picking a book you are willing to drill a hole into (I suggest heading towards the tax law section of your local second hand book store). What's great about these is that they are more than just a temporary display. If you can drill the hole in your book stack the same size as your potted succulent, you can simply place your plant (pot and all) in there and remove when it needs watering. Wait until the water drains out the pot, and back into the book he goes. Brilliant! It could last for years to come! 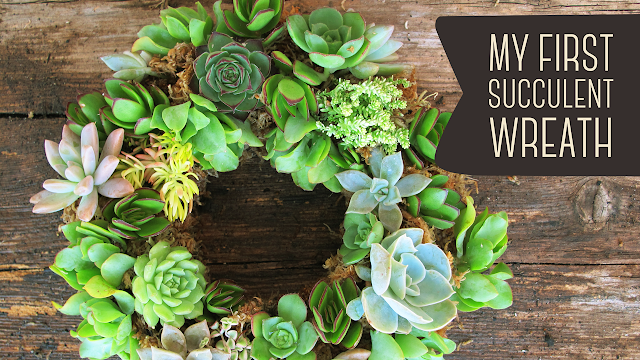 A perfect gift for succulent lovers of all types. A quirky gift for that someone special in your life on Valentine's day. 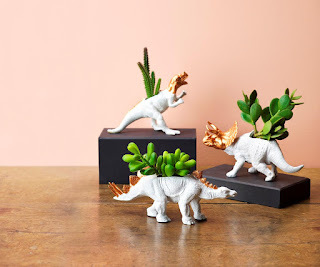 These guys are easier to make than you think, all you need is some sharp scissors or tin snips to cut a hole in a plastic dinosaur. Poke a hole or two in the bottom for drainage and plant away! I personally would love to see these with a cactus or two in them. You can leave the dinosaurs Au Naturel, or paint in funky colours - flouros, metallics, any colour that takes your fancy! 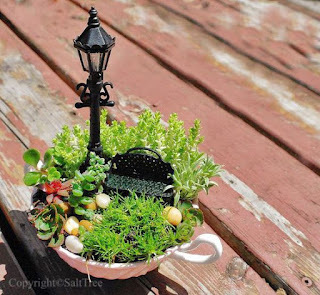 Miniature gardens or fairy gardens don't have to be a grand affair. A simple pot with 2 or 3 succulents and 1 or 2 miniature accessories make a gorgeous display, and a great gift for Valentines Day. Pick accessories that match in size and theme and you can't go wrong. I do recommend planting into a container with a drainage hole, so the garden can live on well into the future. See our range of Miniature Garden Accessories on our website. 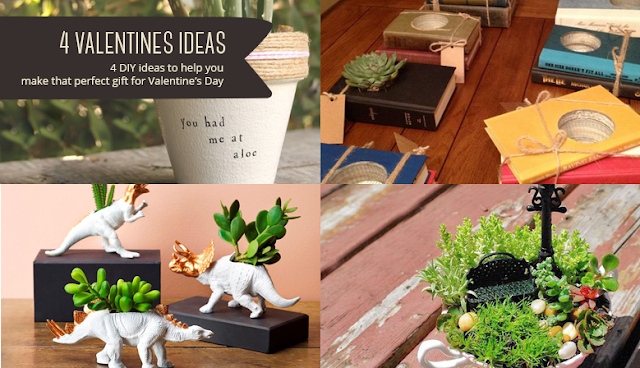 So there you have it, 4 more ideas to DIY your way into any succulent lovers heart this Valentines Day. Be sure to check out our Valentine's article form last year - 4 Delightful DIY Succulent Valentine ideas - for more gift ideas and tutorials. As we delve deeper into the Summer months, scorching temperatures are yet again rearing their ugly heads. Perth is renowned for its intensely hot sun, and our recent maximums of high 30's are only a sign of things to come. Succulents are, in a way, incredibly drought and heat tolerant. However, they aren't completely immune to burning and stress if they are exposed to extended periods of direct sunlight. This is particularly true of freshly planted succulents whose roots are yet to establish. However, there is hope! There are a few tricks and techniques that can help get succulents through summer's scorching temperatures. 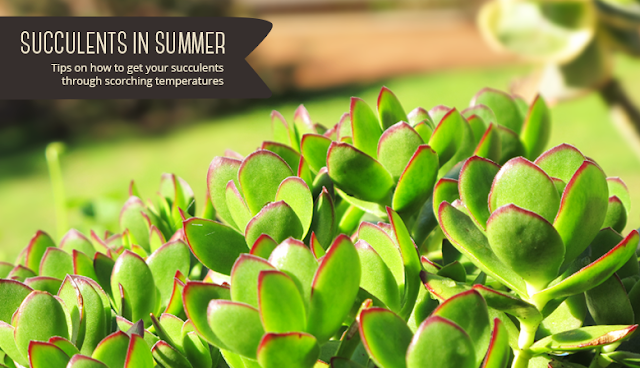 If your succulents are receiving direct sunlight for more than even a few hours each day during summer, their foliage may burn. Older, more established plants may be able to hack the pace, but younger plants will need a little protection during this time. Option 1: Relocation. If your succulents are in pots that are small enough to move, than I would highly recommend temporarily relocating them to a part shade position, such as under a verandah or patio. This is just for the time being, and they can be happily moved back out into a full sun position after the sun starts to calm down later in the season. Be sure that they can still receive plenty of indirect sunlight during this time. Option 2: Shade Cloth. If your plants are too big to move, or planted into the garden, you can create a little sun shade for them, using a small piece of shade cloth and a few bamboo stakes. It doesn't have to look grand, it just has to temporarily provide protection from the sun. This trick is especially helpful to newly planted succulents, as they may not have had the time to acclimatise to their new environment. Be sure to use 50% shade cloth and not 80%, so the plant can receive enough light. 1. Water Thoroughly. Even though succulents are incredibly water wise, it is always a good idea to water them thoroughly until the water drains through the bottom of the pot. If in the garden, water deeply into the soil, so that the entire root system is sufficiently wet. The reason we do this is because a root system will only develop within reach of its water supply. If only the top soil is wet (which is what happens with a sprinkling of water) then the root system will remain small and shallow. This will greatly diminish the plant's defence against the heat, and before long you will start to notice a sickly looking plant. 2. Water during cooler times of the day. If at all possible, water your succulents in the early morning or the late afternoon. Avoid watering during the peak of the day, as the combination of heat and water can cause some succulents to rot. 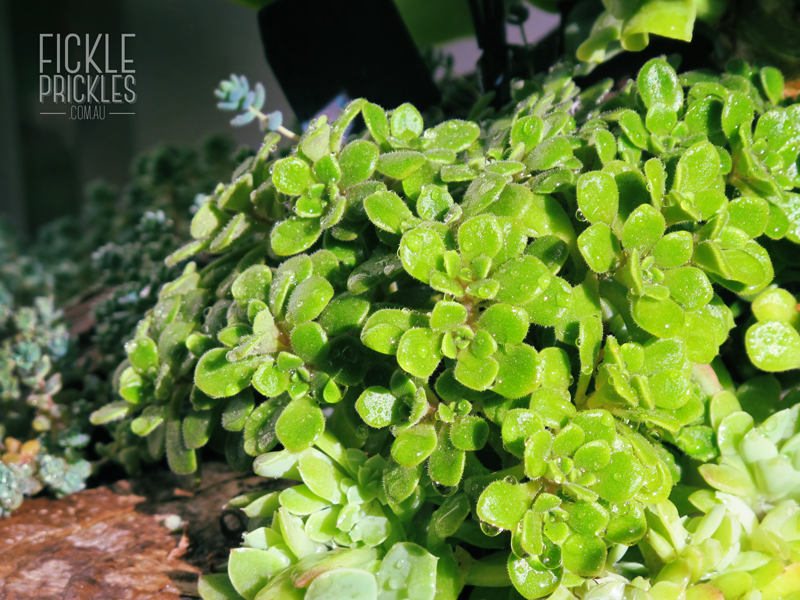 Rosette type succulents in particular will thank you for an early or late drink, as the water can pool in the middle of the rosette and act as a magnifying glass for the sunlight, burning the centre foliage of the rosette. Check to see that when you water your succulents, the water is getting to the roots of your plant and not just sitting on top of the soil. Check not only succulents in the garden but also those in pots, as sometimes the water can run down the inside of the pot and not get into the actual root ball. If you find this is the case, simply apply a soil wetting agent as directed and you will see the results immediately. Some dire cases may need re-potting, or topping up with fresh potting mix. You can apply a soil wetting agent to your containers and gardens a couple of times over the hot summer. The difference will amaze you. The plants will cope a lot better if they are getting sufficient water. Mulching your succulents will help keep the evaporation rate of your soil to a minimum. Soil will dry out a lot quicker if it is exposed to sunlight. This principle applies to both succulents in the garden, as well as to those in pots. Wood chips, gravel and pebbles all make excellent mulches, and they can also liven up the look of your plants too, with many different coloured mulches now available on the market. 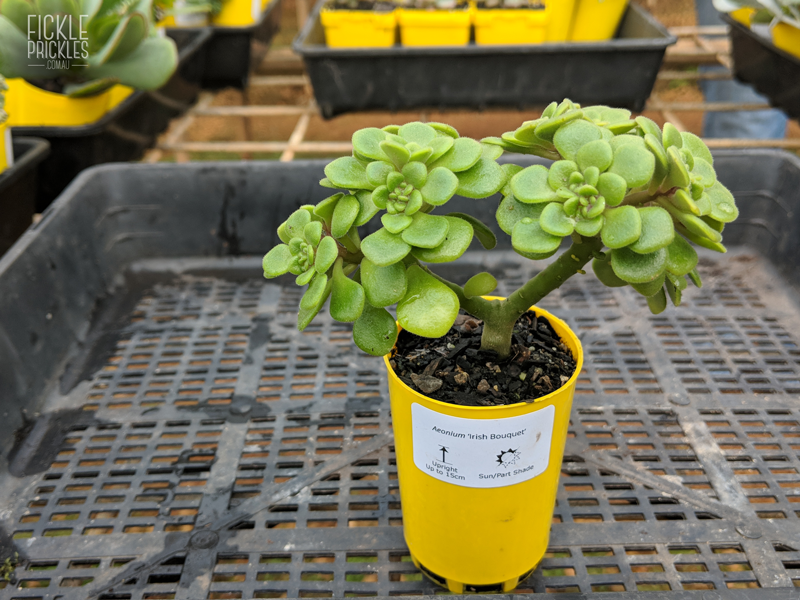 By following these simple tips and tricks, your succulents will be a little happier over these drearily hot months and continue to grow and thrive long into the New Year. 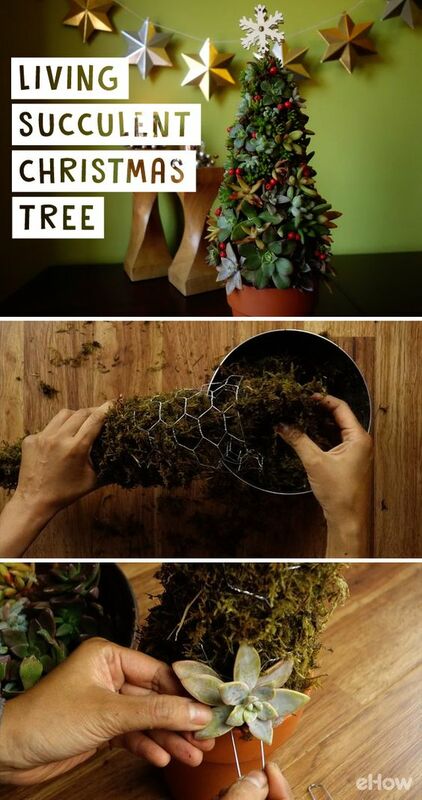 I've thought about making a succulent tree before using a cone shaped florist block, but this is so much better! By using chicken wire and sphagnum moss, this tree will not only look pretty just for the holidays, but with some occasional maintenance can last for months and months afterwards! A little tip I have picked up that could be useful here is that I have never once used pre-made floristry pins. I find bending a bit of wire in half works just as well, and a roll of wire purchased from your local hardware store can make hundreds of pins, saving you a little bit money. I really like the idea of incorporating the odd bunch of plastic red berries here and there. You know the ones, you can get them from pretty much any store selling Christmas decorations. Not expensive at all, and it will give your tree just that touch of red among the green shades of the succulents. I just love succulents mixed with candles. 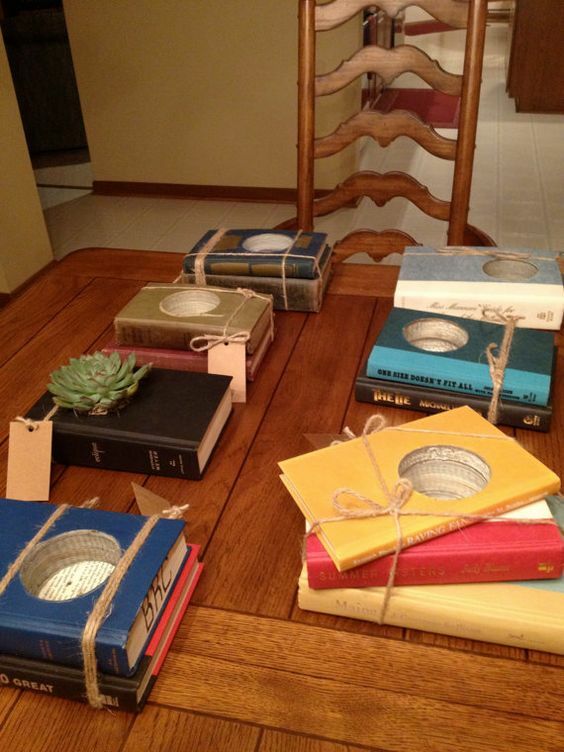 This is a great idea for a large Christmas table. A centre piece like this could be made from an inexpensive wooden box found at a discount store. Jazz it up with watered down white or light blue paint for that antique look. 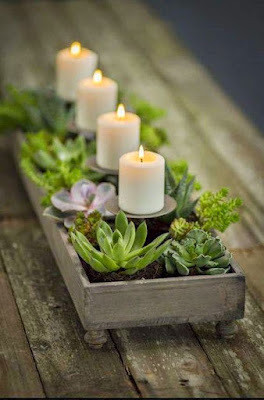 This could be a temporary display, made up with sphagnum moss and succulent cuttings, or for a more permanent display, you could drill holes in the bottom and plant established succulents with a cacti and succulent potting mix. I would recommend lining the wood with plastic and poking holes into that as well. This just protects the wood from rotting, whilst still letting the water drain away. 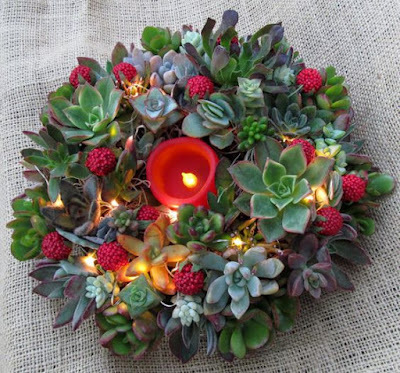 Speaking of Christmas table centre pieces, This succulent wreath with a candle in the middle would look very festive for Christmas lunch or dinner. What a brilliant idea, incorporating a string of battery operated led fairy lights for that touch of drama. 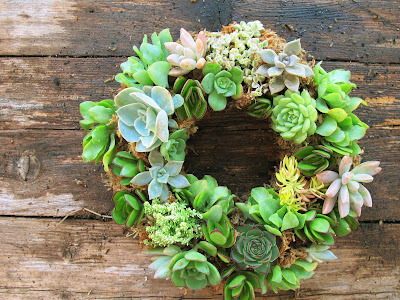 Learn How to make a succulent wreath. 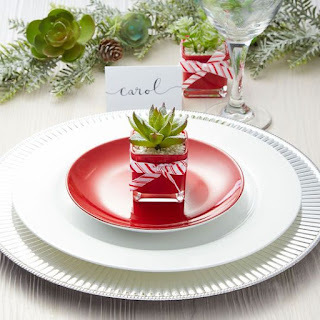 Individual gifts that also serve as placeholders for the Christmas table? Yes, please! Who could resist a little keep sake they can take home after eating all that Christmas pudding. You can buy all sorts of pretty card at any craft shop these days, and with a nice pen you can write names onto them (or if you're like me and possess absolutely no calligraphy skills, you can cheat and use your printer :P ). Glue onto a bamboo skewer and spike into the succulent pot, or simply attach the placeholder card with a ribbon tied around the pot. A great way to pimp up a humble terracotta pot. 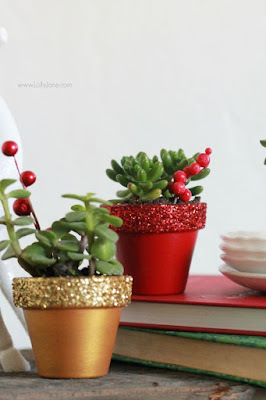 Some paint, decoupage glue and glitter is all you need to make these fabulous succulent Christmas gifts. Full instructions can be found on Lolly Jane's Website. 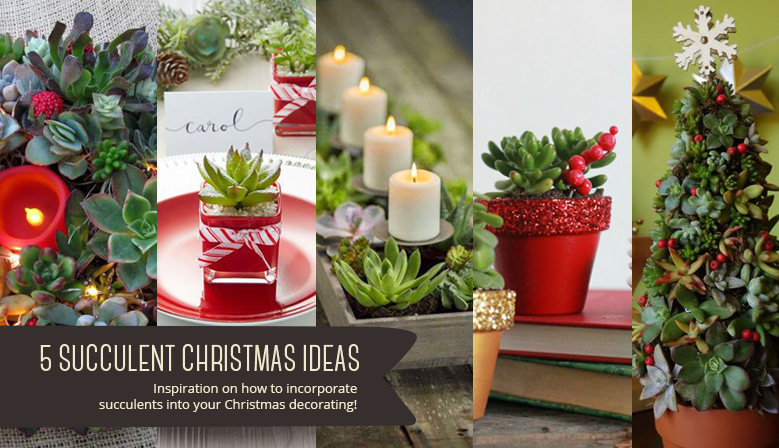 I hope that provides you with a little inspiration on how to incorporate succulents into your Christmas decorating this holiday season. For more inspiration and ideas on Christmas succulent projects, check out our Pinterest board - Succulent Christmas Ideas. If you have any succulent Christmas ideas or projects you would like to share, please comment below! Here is a little video I created of my fist attempt at a living succulent wreath. I was a little bit hesitant filming the process, as I was so sure it was going to turn out a big gobbelty-goopy mess. However, with Kaye pointing me in the direction of what plants and cuttings to use, I'm quite happy with how it turned out! I hope this shows just how easy it is to put one together. The wonderful thing about using fishing line is that it's invisible - so you can use quite a lot of it without ruining the aesthetics of the whole thing. The wreath in the video was created with a small frame - about 20cm in diameter - But we do sell larger frames in our store. Larger ones will need more succulents to fill it out (obviously). This small one took 6 succulents in 50mm pots (3 rosette types and 3 fillers), and then we used a handful of cuttings to fill the wreath out. Two weeks on and the cuttings haven't quite established enough for me to hang it up vertically yet. A couple more weeks should do it. As it has been quite warm lately, I have been watering it once a day, thoroughly with a hose. I would advise against simply misting it, as the moss dries out rather quickly. Dry moss doesn't look as appealing in my opinion, and the added moisture retained in the moss from watering it with a hose will help the succulents grow and thrive for several months to come. No need to worry about the succulents rotting, as the moss doesn't stay sopping wet for very long. 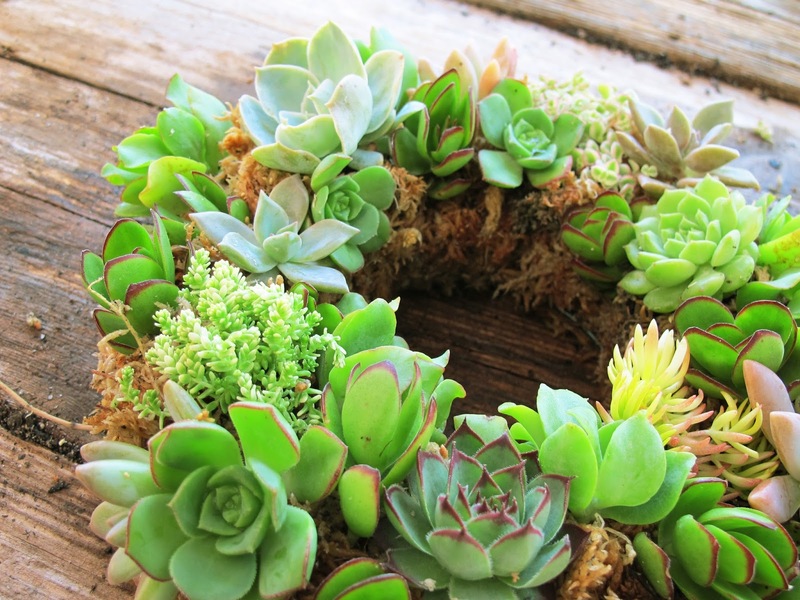 Creating a wreath in this way means that it wont just be a temporary display, but something that can live and thrive for several months to come. Other maintenance tips I can suggest would include not leaving the wreath out in the full sun, applying a seaweed solution to give the plants a kick start, and pruning often to keep nice and compact. I think instead of hanging this wreath vertically, I am going to buy a red plate to rest it on, and put a large white or gold candle in the middle and place it on our family's Christmas table.